As a tourist in my own country, I find it’s difficult to discover homegrown dishes I haven’t tried before. If I were new to the UK I’d be all over the fry-ups, roast dinners, fish and chips and Tikka Masala like a greedy food-seeking missile. But I’ve grown up with that food. I want to try something different. 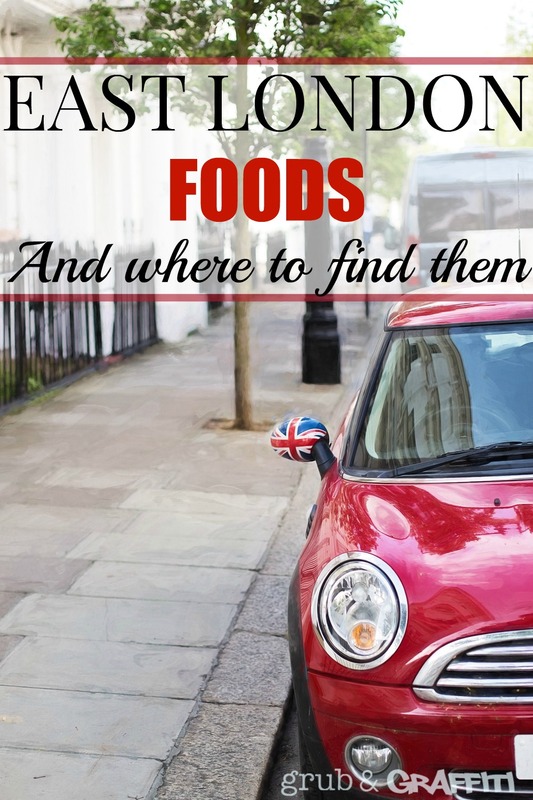 So I figured it would be more fun to search out lesser-known foods that are specific to certain areas of the UK so I can get a real taste of local specialities and dig a little deeper into the culinary quirks of home. First stop: the East End of London. With its colourful and often dark past (hello, Jack the Ripper), the East End is one of the most culturally diverse, bohemian and creative parts of London. Thanks to hundreds of years of immigration, the area now benefits from varied and excellent international cuisine introduced by Bangladeshi, Jewish, Vietnamese and Middle Eastern settlers. 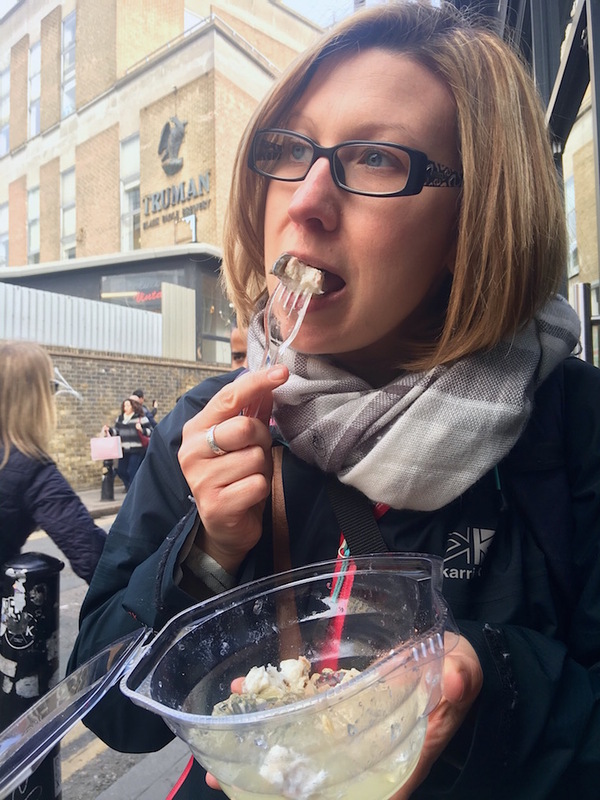 It was tempting to dive into all of them, but as I only had 24 hours in the capital I made a beeline for the two dishes that a) I’ve never tried before and b) seem historically peculiar to the East End: Pie, mash & liquor, and jellied eels. “Who jellies an eel?” This was the very reasonable response I received from my American friend when I told her what I was planning on eating. To be honest, the answer doesn’t make it any more appetising: it’s actually the eel’s own juices, which seep out during the boiling process and left to cool and congeal into the slightly salty (but largely tasteless) jelly. Yum. 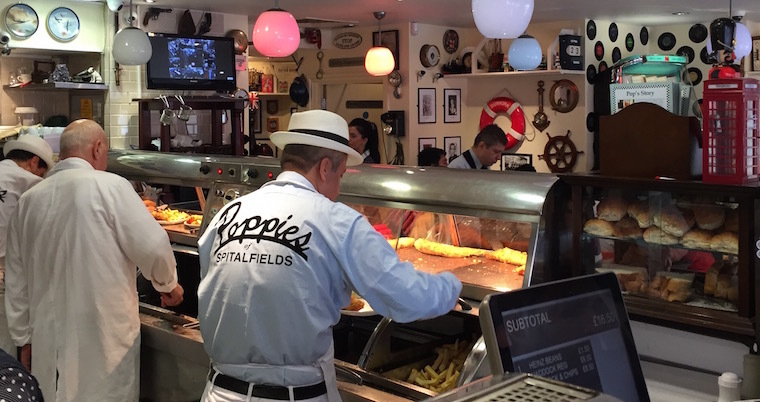 Plenty of places still serve eels in London, but I opted to try them at Poppies Fish & Chips in Spitalfields where they serve it fresh and simple – with a slice of lemon and some thickly buttered white bread. My rational mind says it’s just another type of fish. My lizard brain says: “NO GOOD CAN COME FROM THIS WOBBLING FREAK SHOW! THROW IT AT SOMEONE AND RUN AWAY”! 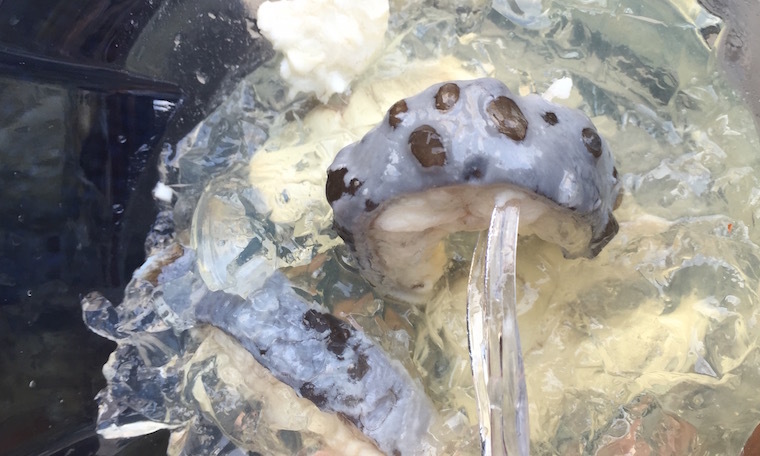 Jellied eels are actually pretty good! Of course, the jelly gets a bit of getting used to. There’s something about all that wobbling about that’s quite unsettling. My top tip is to be generous with the lemon because it adds a citrus flavour that makes it far more palatable. The eels themselves are really quite tasty. They’re meaty in texture and not overly fishy at all. In fact, it reminded me of a really mild-tasting mackerel. I ate it complete with skin, just because I didn’t know what else to do with it, and although it was slightly rubbery to chew on, it was nothing offensive. The only thing I wasn’t keen on was the spine in the middle of each slice because the spiky bones made it tricky to eat around. Yes, I was trying eels as a novelty dish, but I can see why it was such a popular meal for so long. The eels are substantial and satisfying, the jelly acts as a ‘gravy’, and the doorstep slice of bread and butter is a good vehicle for mopping everything up when you’re done. I’m told that eels became popular simply because they were one of the few creatures able to survive the horrendous pollution in the Thames back in the 1800s. But they’re surprisingly good for you too – like other oily fishes, they’re packed with Omega-6 fatty acids and vitamins A and B12. I’ve had countless plates of pie and mashed potato over the years, but the London version offers a few twists to the usual format. For one, it’s served with a luminous green gravy known as liquor, which isn’t common elsewhere. The other is that there are still surviving pie and mash family dynasties operating from the same well-preserved Victorian premises they’ve used for more than a century. And who doesn’t love a bit of history with their food? 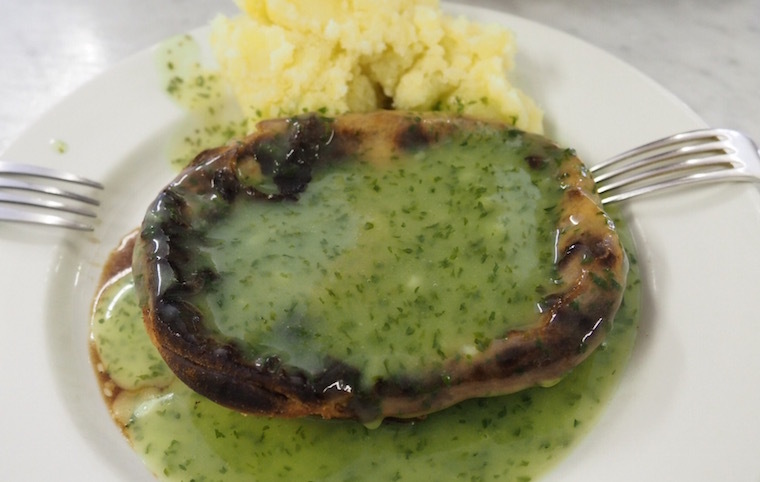 The two major pie and mash families in London are the Manzes and the Cookes. Though the Manzes lay claim to the oldest pie and mash shop in the city (Tower Bridge Road, Est.1891) I opted for F. Cooke on Broadway Market. The shop might be a relative spring chicken having only opened in 1900, but the Cooke family business actually dates back to 1862, which makes them the OG pie n’ mashers in my book. That, and I quite fancied a wander around Broadway Market afterwards, which is a definite must-do if you’re in the area at the weekend. 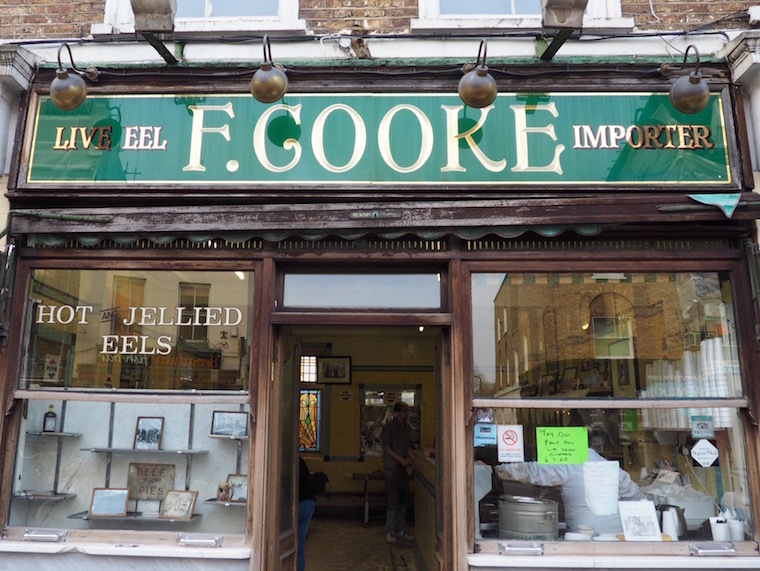 As you can see from the sign on the window, you can get eels here too. In fact, all these shops served eel pies at first, but as meat became cheaper and more readily available, beef took over as the more popular pie filling and the eels were made a separate dish. I love the Victorian grandeur of the frontage – it stands out a mile from the modern shops along the street. Inside, it’s a relatively simple spit n’ sawdust affair with clean, white-tiled walls and rows of long tables and benches. And I’m not lying when I say ‘spit n’ sawdust’ either – they still scatter sawdust, a tradition from the days when people would spit out eel bones onto the floor (rather than fannying about trying to eat around them like I did). But I was there for the pie, and as you’d expect from a no-nonsense London establishment, it was a no-nonsense process. 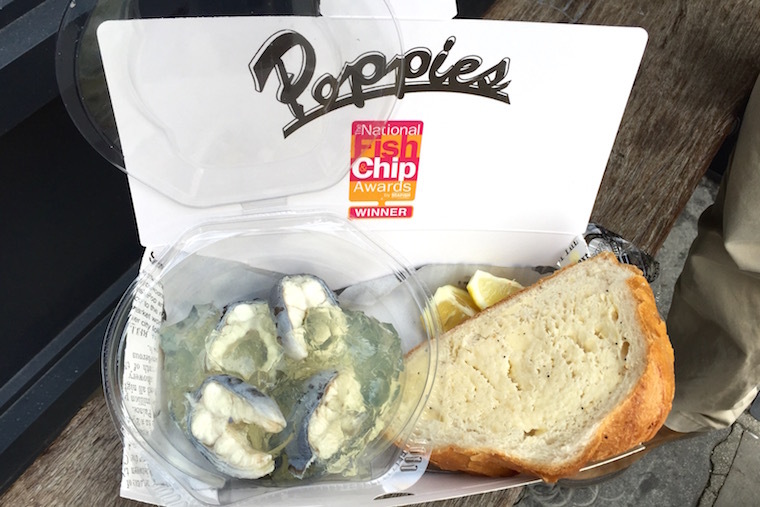 The menu is simple: pie and mash, eels and mash, or jellied eels. You can have large or small portions. But those are your choices. We chose to share a large pie and mash with liquor. There’s a real childlike comfort to sitting down to a hearty meat pie, and we tore through the plate of food and felt happy and satisfied at the end. The pie was well-seasoned and beefy with a good amount of meat inside, and although the pastry was good it had a slightly burnt crust. Mash-wise, I was a little disappointed. It was bland and felt like a functional filler, although I guess that’s what potatoes are there for. Finally, the liquor – I’m told it’s a type of parsley sauce (hence the bright green) which some pie shops make with eel juices, but I don’t know exactly what was in the sauce we tried. What I can say is that it tasted like a slightly salty (but tasty) gravy and that parsley was definitely involved. It was a good counterbalance to the meat gravy inside the pie and helped to bring out some of the flavours in the mash, too. 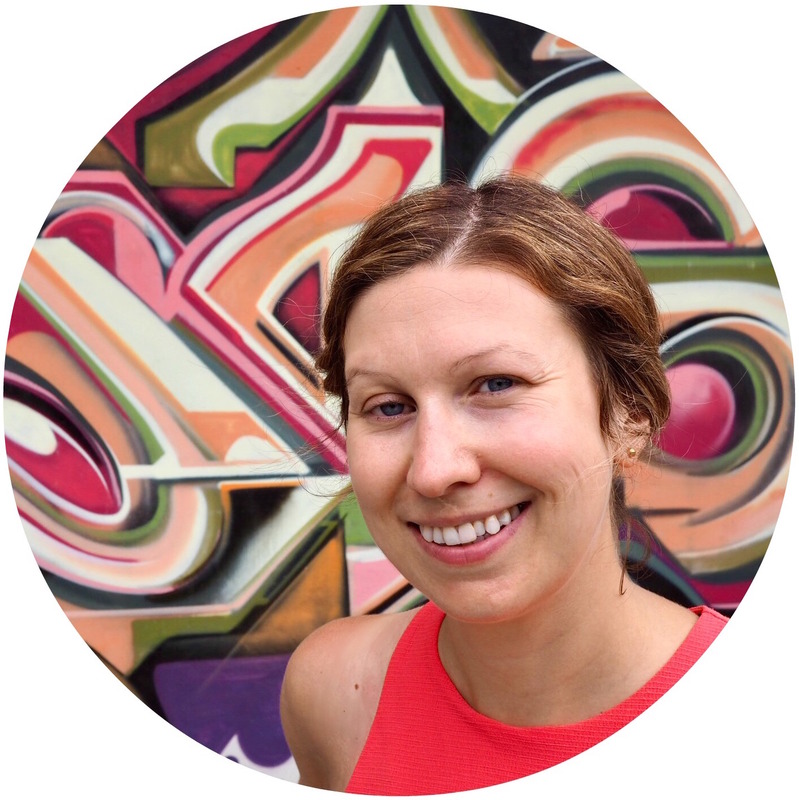 While these items didn’t blow me away in isolation – together, they just worked. And that’s what proper working-class grub is all about – good food that’s simple, filling and tasty. Sweet mother of deliciousness, this has got to rank among the best bagels (beigels?) I’ve ever had. While the bread is excellent, it almost plays second fiddle to the humongous slabs of flavourful hot salt beef wedged in there, along with the sweet vinegary pickles and shot of yellow mustard. The bakery is open 24 hours a day, which means it’s a jeffing good job I don’t live near Brick Lane or I would almost certainly be part-Jen-part-bagel by now. If you want to grab a taste of the Jewish contribution to East London cuisine you can get it here, seven days a week – and I highly recommend that you do. So, what did I miss? 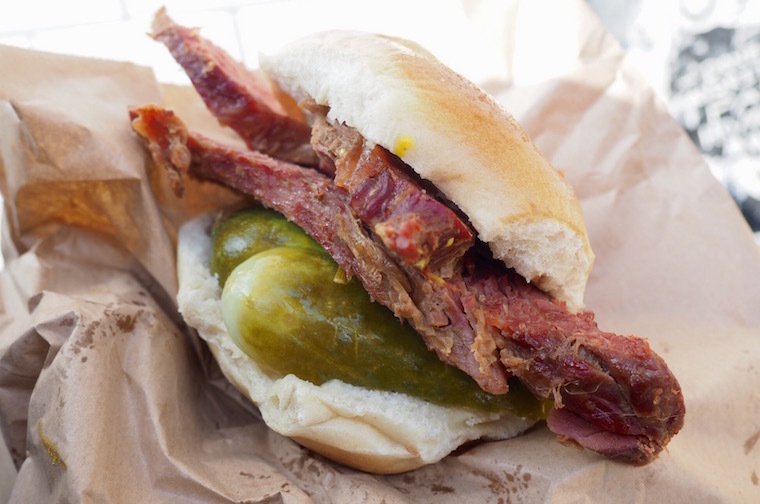 Are there are any other areas of London famous for traditional foods? Let me know in the comments! Cheers!